Almost all of us keep our money in saving account for meeting various items like EMIs and SIP which gets debited in due course. Since these are temporary fund these cannot be deployed in other products like Fixed Deposits with higher tenure of investment. I intend to explain how the temporary surplus fund in your saving funds can be can be parked in one product which gives you better return than saving bank account. Yes I am talking about Liquid funds. Let us understand various features of it. Mutual fund houses are like departmental stores which have many products to offer to each of the investors depending on individual requirement. For long tenure investments you have pure equity funds to liquid fund where one can park funds for a period as short as one day. Some of the investment products of mutual funds have lock in period for which the investments cannot be withdrawn except with penalty in the form of exit load. 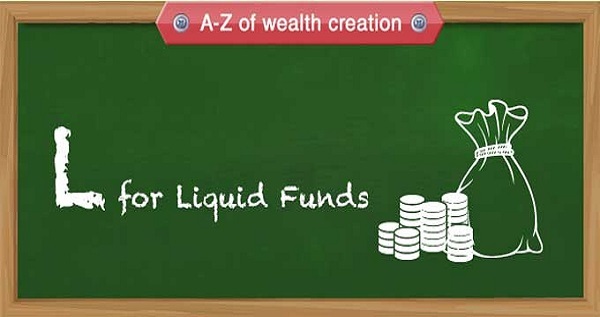 Funds from liquid funds can be withdrawn without incurring any exit load so this product offers more liquidity. Your surplus fund can be put in the liquid fund even for one day. The amount of redemption from liquid fund, generally, gets credited to your bank account within a day time after the request for redemption is placed with the mutual fund house provided the redemption request is made before the cut off time. There are many fund houses like Reliance Mutual Fund, DSP BlackRock Mutual Fund, Aditya Birla Sun Life Mutual Fund, SBI Mutual Fund and UTI where redemption of your amount upto 90% of your investment subject to a maximum of 50 thousands gets credited to your bank account instantly. The liquid funds invest your in treasury bills, call money and deposit certificates of banks with a maturity period not more than 91 days. As maturity period of the products in which liquid fund invest has very small, these funds are relatively safer and less volatile in terms of returns generated. The returns generated by liquid funds are little higher than bank fixed deposits with added benefit of liquidity as you can withdraw the money as much as you want at short notice with no costs associated with like premature withdrawals as are levied by banks for fixed deposits. The average annual returns generated by liquid funds during past one year are 6.88%, which is better than the interest offered on fixed deposits. How the liquid funds can be used? Liquid funds can be used like your saving account with higher returns of around 7% as almost double of what you get on your saving bank account i.e. 3.5%. This excellent product can be used under various circumstances. The liquid funds can be used by the salaried who maintain money in the saving bank account for home loan EMI/house rent or for paying credit card bills during the month. The money in the liquid funds can be withdrawn and transferred back to your bank account just a day before the due date of your EMI/credit card. It generally happens that for those who are looking to buy a property, generally, keep the amount in saving bank account as same may be needed at very short notice. In such a situation you can put the money in liquid fund and earn higher returns meanwhile. The liquidity feature of liquid funds, with no exit load can help the investors who invest the money through Systematic Investment Plans(SIP) as well as. In case you have lump sum to invest park the money in liquid fund and invest through Systematic Transfer Plan (STP) in case you not want to invest the whole of the money at one go in equity due to inherent volatility of equity investments. Even people who have accumulated money in equity fund and are advised to withdraw the money from such fund can keep such money in liquid funds. The liquid funds can also be used when you want to rebalance your money from one asset class to another pending investment in the relevant asset class. With online banking facilities available on smart phone and availability of various application & online platform of mutual fund houses investing in and redeeming money from liquid fund has become very convenient and one need not visit the office of the fund house or their registrar to submit paper application. So you can carry out investment and redeem liquid funds units with your phone anytime anywhere. The liquid funds are treated like any other asset class for the purpose of taxation in India. The holding period requirement for qualifying them as long term capital asset is 36 months. In case you use liquid funds for investing in equity funds at intervals through STP or for withdrawing your investments in equity funds to liquid fund, each such transaction is to be treated as independent transaction and the profits and loss are considered on the basis of units involved in each such transaction based on the period for which such units remained invested. In case the period is 36 months or more the profits are long term else taxed as sort term. The long term profits after indexation are taxed at flat 20% plus cess and surcharge as applicable, whereas the short term profits are added to your regular income and taxed at the applicable slab rate. For long term capital gains you are entitled to claim exemption by investing in a residential house in case the amount involved is substantial. Are NRIs eligible to invest in Liquid Funds? Whether the income earned is Tax Free? After the specified period will it be transferred to NRE A/C, from where it emanated?